Raaga.com: Salman Khan To Launch ‘MAINE PYAR KIYA’ Actress Bhagyashree’s Son? Salman Khan To Launch ‘MAINE PYAR KIYA’ Actress Bhagyashree’s Son? Bollywood hunk Salman Khan may be regarded as arrogant and haughty but when it comes to his near and dear ones, he is a man with ‘Golden Heart’. And that’s not all if he finds someone trust worthy then he opens his heart to them, including giving break in movies. He has been instrumental in launching the careers of many actors. Few among the many include Katrina Kaif, Sonakshi Sinha, Arjun Kapoor, Pulkit Samrat, Bilal Amrohi, Zarine Khan, Daisy Shah and recently his buddy Jackie Shroff’s son Tiger Shroff. According to reports Sallu bhai is ready to launch his MAINE PYAR KIYA co-star Bhagyashree’s son Abhimaanyu. 24 year old Abhimaanyu is equipped with a degree in acting from The Lee Strasberg Theatre and Film Institute from the US and in India from legendary actor Anupam Kher's ‘Actor Prepares’. Besides he has the distinction of being assistant director during the making of Bollywood hit movies DUM MAARO DUM and NAUTANKI SALLA, both directed by Rohan Sippy, son of famed director Ramesh Sippy who made SHOLAY, SAGAR and SHAKTI. Though Bhaygashree has declined to comment on the latest development but inside sources claim that Bhagyashree had initially decided to launch her son Abhimaanyu in 2013 but failed to make it. Hence this year she is leaving no stone unturned to launch Abhimaanyu and has apparently approached Salman Khan to help her. In response Salman Khan has promised her to do his best in giving Abhimaanyu a solid debut. To begin Salman Khan has instructed Abhimaanyu to work on his fitness and focus on acting tips that he has shared with him. If all goes well there are chances that Salman Khan may give Abhimaanyu a break in his home production. 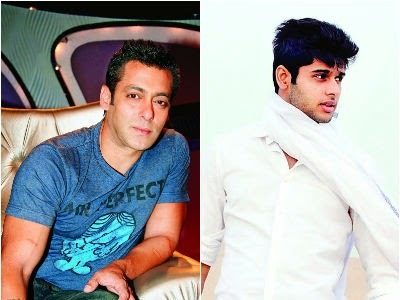 It may be recalled that besides giving breaks to talented actors from outside the film industry Salman Khan has the reputation of launching many star children that includes star sons like Sunil Shetty's daughter Athiya and Aditya Pancholi's son Suraj in his home production and has been very helpful in launching actor Jackie Shroff’s son Tiger Shroff.